The ACEA Group’s activities expose it to a variety of financial risks, including interest rate and price risk. The Group uses derivative instruments to hedge certain risk exposures, whilst such derivative or similar instruments are not generally used or held solely for trading purposes. The Group is not particularly exposed to this type of risk, which is concentrated in the translation of the financial statements of its overseas subsidiaries. As regards the 20 billion yen private placement, the exchange rate risk is hedged through a cross currency swap described in the section on interest rate risk. The Group is exposed to market risk, represented by the risk that the fair value or future cash flows of a financial instrument fluctuate as a result of market price movements, above all in relation to the risk of movements in the prices of commodities in which the Group trades. Acea Energia Holding, through the Risk Control Unit, ensures the analysis and measurement of exposure to market risks, interacting with the Energy Management Unit and Acea Energia, in line with the guidelines of ACEA’s Internal Control System and with the Risk Management Manuals of ACEA’s Energy Industrial Area. Risk analysis and management is performed according to a Risk Management process which involves the execution of activities throughout the entire year, on the basis of different frequencies (annual, monthly and weekly). The execution of those activities is distributed between the Risk Control Unit and the Risk Owners. on a monthly basis, the Risk Control Unit is required to check the portfolio’s exposure to risk and check compliance with the limits defined. As required by the Internal Control System, the Risk Control Unit is responsible for sending ACEA’s Internal Audit Department the required information in the proper format. reduce the possibility of over-hedging deriving from the variation in expected volumes for the definition of hedges. Market risk is distinguished from price risk, i.e. the risk related to the variation in commodity prices, and volume risk, i.e. the risk connected with the variation in volumes produced and sold. delegate risk owners with the job of defining the necessary strategies for hedging individual risks, in respect of pre-established minimum and maximum levels. creation of reference scenarios (prices, indexes). Derivative transactions are entered into for the purpose of hedging the risk of fluctuations in commodity prices and in compliance with the provisions of Risk Management Manuals for the Energy Industrial Area. 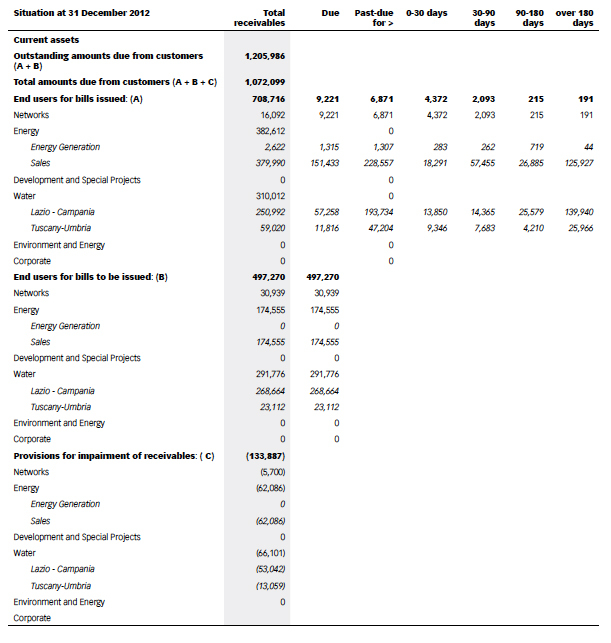 In terms of the Group’s commitments for the coming year, in order to stabilise cash flows in relation to the composition of its sale and purchase portfolio, almost all existing hedging activities carried out have the principal purpose of cash flow hedges, since the effectiveness of the hedge is demonstrable. Only a limited number of transactions are not classified under this option, and as a result are measured at fair value. The financial instruments used fall under swaps and contracts for difference (CFD). It should be noted that the hedges effected on the purchases portfolio were conducted with the leading operators in the electricity market and the financial sector. Acea Energia Holding designates the hedge in respect of commitments to buy and sell electricity. The company prepares specific documentation demonstrating the prospective effectiveness of the hedge. This is done via simulation of what are assumed to be representative movements in the forward price curve for the respective indices, and the related comparison between movements in the fair values of the actual and hypothetical derivative instruments, where the latter represents a derivative financial instrument with contract terms matching those applicable to the physical contract. Power portfolio transactions qualify as effective when the hedging relationship, calculated on the basis of the ratio in absolute terms of movements in the actual derivative instrument and those in the hypothetical derivative instrument, lies within a range of 80%-125%, as defined by IAS 39. The retrospective and prospective effectiveness test applied to these transactions at the end of the year confirmed the hedging relationship. However, should the derivative instrument, at the time of execution, be designated as a hedge of purchases of electricity in the form of contracts for difference (CFD), the company does not prepare specific documentation demonstrating the effectiveness of the hedge. In fact, the Group treats CFDs as financial instruments, which are activated when the relevant contractual condition is met, i.e. when at a certain hour of a certain day the price on the electricity exchange is higher or lower than the strike price (reference parameter). As a result, these transactions do not qualify as contracts that may be defined as hedging physical underlying transactions pursuant to IAS 39. Gains and losses resulting from the management of market risk using these contracts are, in the case of both CFDs and derivative instruments, measured at fair value with the differences recorded in the income statement. The fair value of the CFDs at the end of 2012 with an impact on the income statement is null, while the effective portion is a negative 1,759 thousand euros. The portfolio of financial instruments accounted for under hedge accounting, which represents the main component of the entire portfolio, is perfectly balanced in terms of the risks from the underlying assets in the hedge. The remaining financial instruments not accounted for under hedge accounting, despite not fully satisfying the requirements of IAS 39 for hedge accounting (cash flow hedge), are however, exposed to risk factors in contrast to those affecting physical portfolios for purchase/sale, in such a way as to balance their potential variations with a view to “operational” hedging in line with company guidelines. level 3: if the fair value is calculated using evaluation techniques that assess parameters not observable on the market. for complex indexes (ITRemix, PUN profiled products, ….) the fair value level is 2 given these derivatives are the result of formulas containing a mix of commodities listed on active markets. For certain components of complex indexes, the fair value level is 3 as they do not derive from listing on active markets but, instead, estimates. ACEA SpA’s liquidity risk management policy is based on ensuring the availability of significant bank lines of credit. Such facilities exceed the average requirement necessary to fund planned expenditure and enable the Group to minimise the risk of extraordinary outflows. In order to minimise liquidity risk, the ACEA Group has adopted a centralised treasury management system, which includes the most important Group companies, and provides financial assistance to the companies (subsidiaries and associates) not covered by a centralised finance contract. As at 31 December 2012, the Parent Company held committed and uncommitted lines of credit totalling 865.5 million euros and 645 million euros, respectively. No guarantees were issued to obtain said credit lines. The committed lines of credit are revolving and have terms of between twelve months and three years from subscription. A total of (i) 100 million euros of said credit lines is available until the first quarter of 2013, (ii) 45 million euros until 31 December 2013, (iii) 100 million euros until 31 December 2014, (iv) 400 million euros until 31 December 2015; the contracts entered into provide for the payment of a fee for non-use plus an upfront fee paid at the time the credit lines are opened. On the amounts drawn down, ACEA pays an interest rate equal to the one, two, three or six month Euribor (depending on the period of use chosen beforehand), plus a spread which, in some cases, may vary in line with the rating assigned to the Parent Company. In some cases, there is also a utilisation fee linked to the amount disbursed. Furthermore, as at 31.12.2012, it should be noted that ACEA has an additional medium/long-term committed credit line of 100 million euros in place, stipulated in December 2012, with a utilisation period of 12 months and a maximum duration of 15 years from disbursement, which has not been used as at the close of the financial year. The abundance of lines (committed and revocable) allowed the parent company to handle temporary increases in short-term requirements with no impact on operations. At the end of the year, ACEA had no loans - term deposits and similar transactions - unlike last year when that value totalled 79.2 million euros. Gori: the bridge loan of 40 million euros, disbursed by BIIS, expired on 30 June 2011, and at the current state of play, it is working with the Area Authority to transform the loan into a long-term mortgage. By notice no. 17548 of 6 March 2012, GORI asked BIIS for a technical extension until 30 June 2012 on the expired loan, attaching a debt rescheduling proposal prepared at the bank’s request, to further reduce the loan repayment period, which envisages repayment with a first amortisation instalment on 31 December 2012 and final maturity of 30 June 2018. In this respect the bank replied that it had submitted the proposal to its decision-making bodies. In order to define relations with BIIS and reschedule the 40 million euro debt, imminent developments are currently pending in the much hoped for framework agreement with the Campania Regional Government and the Extraordinary Commissioner of the Sarnese Vesuviano Area Authority (formerly the Sarnese Vesuviano Area Authority). Acquedotto del Fiora signed an extension of the bridge loan for a further eighteen months (expiry: September 2013) and obtained an increase of 12.8 million euros, increasing the loan to 92.8 million euros. The graph below depicts the future development of all debt maturities, forecast based on the situation at the end of the year. The ACEA Group’s approach to managing interest rate risk, which takes account of the structure of assets and the stability of the Group’s cash flows, has essentially been targeted, up to now, at hedging borrowing costs and stabilising cash flows, in such a way as to safeguard margins and ensure the certainty of cash flows deriving from ordinary activities. The Group’s approach to managing interest rate risk is, therefore, prudent and the methods used tend to be static in nature. A static (as opposed to a dynamic) approach means adopting a type of interest rate risk management that does not require daily activity in the markets, but periodic analysis and control of positions based on specific needs. This type of management therefore involves daily activity in the markets, not for trading purposes but in order to hedge the identified exposure over the medium/long term. ACEA has, up to now, opted to minimise interest rate risk by choosing a mix of fixed and floating rate debt instruments. As previously noted, fixed rate debt protects a borrower from cash flow risk in that it stabilises financial outflows, whilst heightening exposure to fair value risk in terms of changes in the market value of the debt. In fact, an analysis of the consolidated debt position shows that the risk the ACEA Group is exposed to is mainly in the form of fair value risk, composed as at 31 December 2012 of fixed rate borrowings (64%). With reference to the current portfolio make-up, the Group is partly exposed to the risk of fluctuation in future cash flows and, by contrast, to a greater extent than changes in fair value. The current mix of fixed and floating rate debt and also taking account of the trend still expected in market interest rates, in a predominantly recessionary macroeconomic phase essentially not tending towards sudden rises, has made it possible to take advantage of lower short-term rates to a large extent, thus mostly balancing the high spreads still applied by the credit system as a result of notable events linked to the worsening in guaranteed returns on the debt of certain sovereign European states, including Italy. The possibility of executing some floating-to-fix hedging activities in the future to reposition the fixed-floating mix is still an option, as soon as market outlooks make that repositioning opportune. to manage derivatives transactions solely for hedging purposes, should the Group decide to use them, in respect of the decisions of the Board of Directors and, therefore, the approved strategies and taking into account (in advance) the impact on the income statement and statement of financial position of said transactions, giving preference to instruments that qualify for hedge accounting (typically cash flow hedges and, under given conditions, fair value hedges). Umbra Acque swapped a medium/long term loan for a fixed rate. All the derivative instruments taken out by ACEA and listed above are non-speculative and their negative fair values are 12.7 million euros and 10.8 million euros, respectively. The fair value of medium/long-term debt is calculated on the basis of the risk-free and the risk-adjusted interest rate curves. Sensitivity analysis has been carried out on medium/long-term financial liabilities using stress testing, thus applying a constant spread over the term structure of the risk-free interest rate curve (for the Euro area at 31 December 2012). 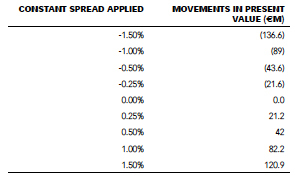 The following table shows overall movements in terms of the fair value of liabilities based on parallel shifts (positive and negative) between –1.5% and +1.5%. As regards the type of hedges for which the fair value is calculated and with reference to the hierarchies required by the IASB, given they are composite instruments, they are categorised as level 2 in the fair value hierarchy. ACEA has issued credit policy guidelines which identify the different strategies which reflect the Customer-Centric philosophy: through flexibility criteria and on the strength of the activities managed, as well as customer segmentation, credit risk is managed by taking into account both the customer type (public and private) and the non-uniform behaviour of individual customers (behavioural scores). definition of the necessary responsibilities/authorisations for any exceptions. adequate reporting and training of dedicated staff. With regards to electricity distribution activities the wholesalers represent credit risk: billing of the latter relates to the transportation of electricity on the distribution network and services performed for end customers. Credit management starts with the “behavioural score” or knowledge of the individual reseller through the constant analysis of payment attitudes/habits and is subsequently broken down into a series of targeted actions ranging from phone collection activities carried out in-house, reminders sent electronically, sending of notice letters via registered post, as provided under resolution ARG/elt 4/08, to termination of the transportation contract. As regards sales of electricity, credit risk was measured beforehand, especially in relation to the sale of gas and electricity to industrial and business customers. The activity was performed in accordance with Credit Risk Policy Manual rules, through an in-house process involving the evaluation of credit reliability, assignment of an internal rating and recognition of the maximum limits of financial exposure to the counterparty. As regards Acea Energia, by launching the new "CREDIT CARE" application for credit management, in July 2012, it complied with the Credit Policy Guidelines issued by the holding company Acea S.p.A. and in force since 1 January 2012.
limiting payment delays, the insolvency of customers supplied, the growth in the credit exposure in general and debt collection costs, minimising partial or total losses on Group company receivables. procedures for impairment, disposal, recognition of losses and cancellation of receivables. variable risk of insolvency and late payment risk for private sector end users. As regards credits due from public sector end users, which account for over 30% of the past due receivables, they are converted to cash through the without-recourse factoring to financial partners and a residual portion is managed directly through the offsetting of receivables/payables or by means of settlement agreements. Credit management for private sector end users, which represent approximately 70% of the past due receivables, starts with behavioural scores or “knowledge in terms of the probability of default of each individual customer through the constant analysis of payment attitudes/habits”, and is subsequently implemented through a series of targeted actions ranging from reminder letters, assignment to specialised companies for credit recovery via phone collection, to detachment of the defaulting end users and receivable factoring transactions. The water segment is also characterised by a significant amount of invoices to be issued which are determined by the characteristics of the business. 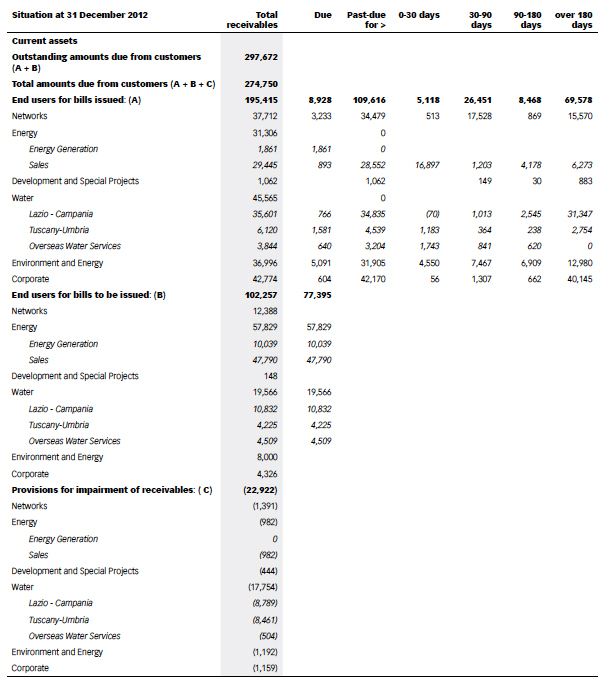 The following table summarises the different types of receivable described in Note 22 – Trade receivables.